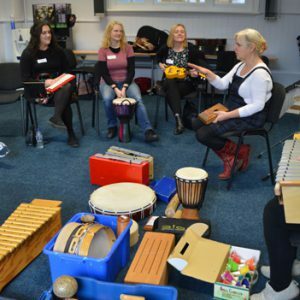 Our popular two-day course – Making Music with Special Children – will help you to find out how music can help you to communicate with children who have special needs or disabilities. You’ll find booking information at the bottom of this page. The course is open to anyone working with children who have additional needs, complex needs, or life-shortening illness: whether you’re a musical novice or have some experience you will go away with plenty of ideas and techniques to put into practice in your work. We aim to give you the skills and confidence to make music with children. For those working in settings without a music specialist this support will be especially needed, but even where there is a trained musician to hand your new-found skills will prove invaluable. Mark Withers is a clarinettist and creative project leader for orchestras and other organisations around Europe, delivering music projects for children with a wide range of needs, and training those who work with them. He is joined by music therapists working in children’s hospices: Vicky Kammin in London and Cathy Ibberson in York. There are courses in London (3 minutes’ walk from Highgate station, which is a 15 minute tube ride from central London) and in York (7 minutes’ walk from York station). Each course comprises two consecutive days of workshops, and the content covered is common to both. Monday 11th November 2019, 10.30am – 5.00pm and Tuesday 12th November, 10.15am – 5.00pm. Thursday 14th November 2019, 10.30am – 5.00pm and Friday 15th November, 10.00am – 4.45pm. Please fill in the booking form at the bottom of this page in good time before the booking deadline, which is 25th October. We advise early booking: we are sometimes over-subscribed and have had to turn people away. Places will be allocated on a first come, first served basis. We will let you know if you have a place shortly after receiving your application, and we will send your invoice a few weeks before the course takes place. Jessie’s Fund is able to subsidise this two-day course thanks to a grant from a charitable foundation: we can offer it for only £80 per person for both days, including lunch, coffees and teas. For two days of first-class training this represents exceptional value. If you need to cancel your booking one of your colleagues may like to take your place, in which case please inform us of the change. If no-one takes your place, a 100% refund will be available prior to 11th October, or a 50% refund will be given for cancellations between 11th October and 25th October. We regret that we cannot refund any fees after 25th October. Which course are you booking on? Tell us about any particular aims you have in attending the course?